Nael Eltoukhy, born in 1978, is an Egyptian author and journalist who graduated from the Hebrew Department of Ain Shams University, and who has also translated several works from Hebrew to Arabic. His short story “The Machos” appeared in Banipal 43 in a translation by Wiam El-Tamami. Women of Karantina, his fourth novel, was published in Arabic as Nisa’ al-Karantina in 2013, and was recently shortlisted, in its English translation, for the inaugural FT / OppenheimerFunds Emerging Voices Awards. Characterised by the translator himself on the Arabic Literature in English webpage as “a savage comic epic, relentlessly ironic, uncompromisingly rude, profoundly moral, totally true [and] good value for money”, this sprawling work, which runs to nearly 300 pages in English translation, seems impossible to classify. Best described, perhaps, as a sort of mad fantasy, it is a “future history”, whose opening chapter starts with a hungry dog rummaging through the trash on March 28, 2064 – “the grimmest [day] in Alexandria’s history” – and whose “plot”, if one can use the term, leads us through three generations of gangsters, madmen, and a cast of characters from the Egyptian underworld who play out their dreams and family feuds amidst the decaying suburbs of Alexandria over a period of fifty years or so. 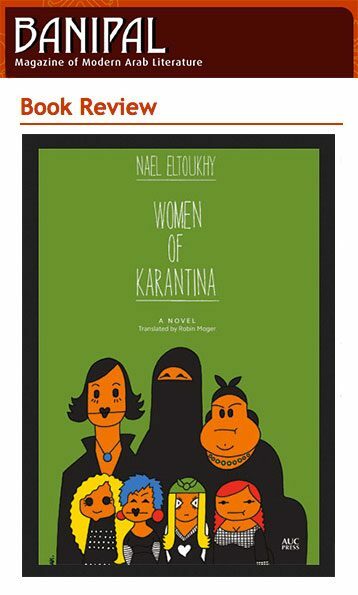 Paul Starkey reviews Women of Karantina by Nael Eltoukhy, translated by Robin Moger for Banipal Magazine. Click here for the complete review.